A significant album if for only one reason, it features one of the final vocal performances of David’s cousin — Ronnie James Dio. So I admit that was the major selling point for me because I had picked up Feinstein’s Third Wish CD when that first came out I was disappointed by it. I wasn’t really sure what to expect from this album but it’s a solid slab old school hard rock and heavy metal. Though I’m not familiar too much with the band (other than a few songs), I’ve read some reviews saying the sound is similar to The Rods, which Feinstein is a member of. Though this is a solo album, when it comes to the Dio track “Metal Will Never Die”, it’s the complete Rods line-up of Feinstein, Bordonaro and Canedy backing him up. Pretty cool! There’s a heavy blues influence to this album with Feinstein showing his roots in Elf. “Rock’s Boogie” and “Gambler Gambler” are like Elf on steroids while “Smoke On The Horizon”, “Evil In Me”, “Run For Your Life” and “Kill The Demon” are just pure heavy metal with some blistering guitar work from David. Of course, “Metal Will Never Die” is the real highlight of the album — it’s Ronnie & The Rods! A typically great vocal performance from Dio. It’s a mid-tempo number sounding like something he may have recorded on a later Dio album, maybe Killing the Dragon or Master of the Moon. I had read there was talk between Ronnie & David about doing a full album together, it’s a shame we’ll never get to hear that. My one complaint about this album is the mix. The vocals are pushed way too much in the back. At first, when listening to “Smoke On The Horizon”, I thought maybe that was the effect Feinstein was going for with that particular but it’s the same case throughout the CD. This is especially apparent on “Metal Will Never Die”, the mix just doesn’t do Ronnie justice. It’s almost like there is some weird vocal effect going on throughout the whole album. 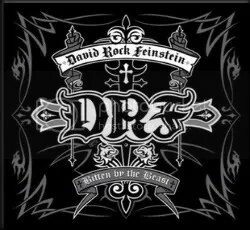 The guitars sound great though, nice dirty sound to them and Feinstein is definitely a gifted guitarist and knows how to write riffs. It’s puzzling he never found more success during heavy metal’s ’80s heyday. Overall, DRF has turned in one fine old school metal album!